Pamlico Sound routes adding extra departures for Easter weekend. 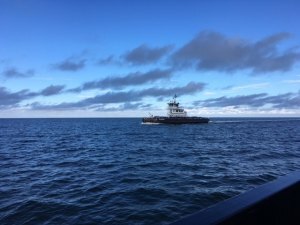 The North Carolina Ferry System’s popular Hatteras-Ocracoke route will be switching to its spring schedule on April 9, boosting the number of daily round-trip departures from 18 to 26. From Hatteras: 5, 6, 7, 8, 8:30, 9, 10, 10:30, 11 and 11:30 a.m., noon, 1, 1:30, 2, 2:30, 3, 4, 4:30, 5, 5:30, 6, 7:30, 8, 9 and 11 p.m., midnight. From Ocracoke: 4:30, 6:30, 7:30, 8:30, 9:30, 10, 10:30 and 11:30 a.m., noon, 12:30, 1, 1:30, 2:30, 3, 3:30, 4, 4:30, 5:30, 6, 6:30, 7, 7:30, 9, 9:30 and 10:30 p.m., midnight. In addition, the Ferry System’s Pamlico Sound routes between Cedar Island, Swan Quarter and Ocracoke will be adding extra departures for Easter weekend (April 19-21). Swan Quarter – Ocracoke: 7 and 10 a.m., 1:30 and 4:30 p.m.
Ocracoke – Swan Quarter: 7 and 10 a.m., 1:30 and 3:45 p.m.
Cedar Island – Ocracoke: 7:30 and 10:30 a.m., 1 and 4:30 p.m.
Ocracoke – Cedar Island: 7:30 and 10 a.m., 1 and 4:30 p.m. The Pamlico Sound routes will resume their regular published schedules on April 22.